Ok- I have had a crazy week and no, I didn’t have ANY time to cook dinner! 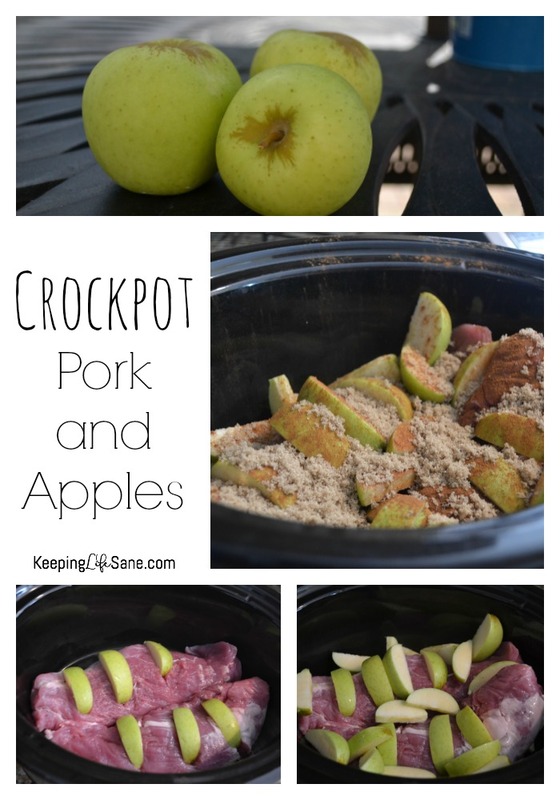 This is a super easy, inexpensive, one pot meal. Don’t you love anything that you can cook in one pot? I love the cleanup! When you have three kids running to three different practices in entirely three different directions, it can be frustrating. My family is doing a no eating out challenge for the month and it’s been VERY difficult. Sometimes it would be so easy to grab fast food, but we are all very competitive and not going to fail. 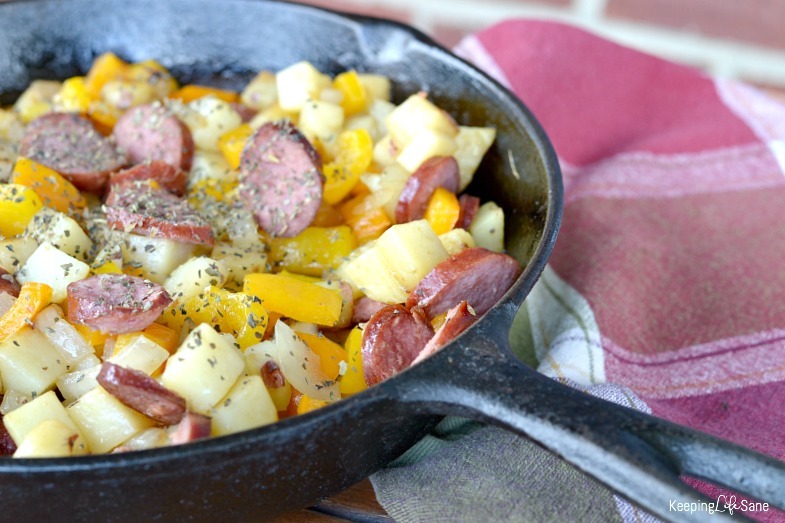 This smoked sausage, potatoes, peppers & onions is a great meal because it heats up nicely. Doesn’t it look so good?? Add cubed potatoes into greased medium-high heat skillet. Cook for 8 minutes, occasionally stirring. Here’s a link to a cast iron skillet. If you don’t have one, then I would really invest in one. They are awesome! Add in chopped peppers and onions. Cook for 3 minutes. Slice smoked sausage and add to skillet. Cook for another 3 minutes. Mix in basil and serve. This is also great for breakfast. Just add an egg on top. Make sure to save those leftovers! This is a super easy, inexpensive, one pot meal. Don't you love anything that you can cook in one pot? 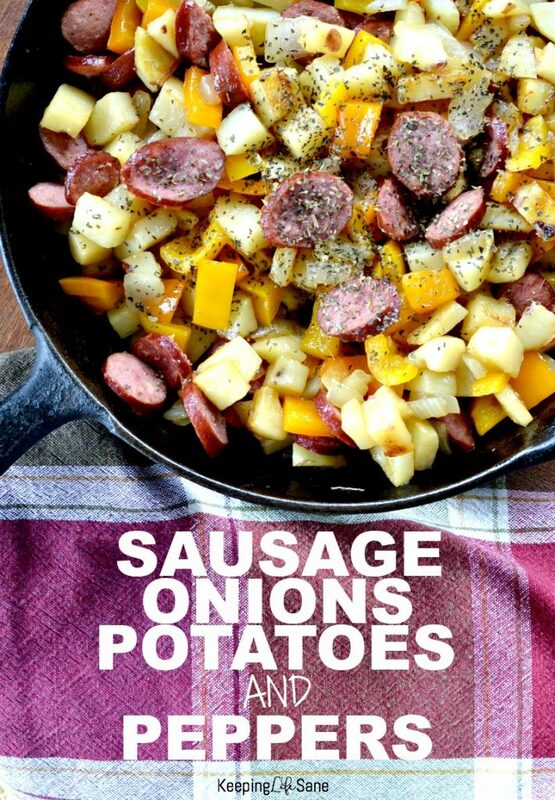 Try this smoked sausage, potatoes, peppers & onions. Add cubed potatoes into greased medium-high heat skillet. Cook for 8 minutes, occasionally stirring. You may like this recipe too!